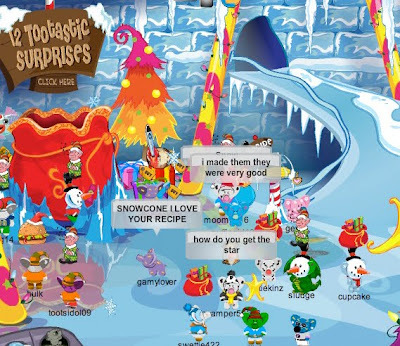 Club Penguin Cheats by Mimo777 Club Penguin Cheats by Mimo777: Mimo's Tootsville Christmas Party Hilights! Toots tree lighting almost a Tootastrofy! 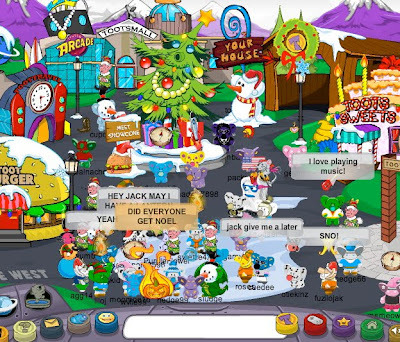 The square was packed for the tree lighting ceremony, Jack and Snowcone were there and they did give out some really cool pivits. Them when they were about to light the tree Shade showed up. He started to take over the square and then he took some peanuts from everyone. Then Shade stole the tree! Yep right in front of our eyes Shade turned the tree into this crazy looking creature, cool but scary. 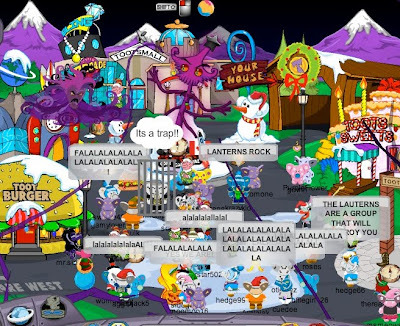 Jack and Snowcone made some Toots honorary LANTERNS (thats a new group of Toots that help Jack lookout for Tootsville). They all got the tree back and it really looked cool, I gotta say Tootsville really puts alot of work into their site. Check out some of the pics from the event and don't forget to keep letting me know when you find more hidden Pivitz! Check out Tootsville now! See you there! Listen Free to the NEW ZOEZOE SHOW SHOW CLICK HERE NOW! But i'm not into Tootsville anymore although I have an account! Maybe the gongs in the ninja hideout give you something if you hit them in a certain pattern? DO you know when jack is going to come on again? I actually started the lanterns! i like swettie422! she kinda famous on tootsville now YOU ROCK MIMO! THATWAS THE BEST PARTY EVER IT WAS AWESOME GOOO LANTERNS! SHADE THE DARKNESS BRING FOURTH THE LIGHT! I was there. you might have missed the part where jack and snowcone were here and then shade came and we went into the ice castle and decided to stop shade. I had to go before the end. well not that cool... not rlly cool....so what there lanterns! so what if you started them, that doesnt make you leader! rlly snowcone and jack and louis are leaders F.Y.I! I don't have a tootsville account yet but I will get one soon. Hey I'm in there imn Moomoo16! Thanks mimo, my website is going well since you helped me! Maybe.. i think so.. i hope so also! Hey, Mo.... this Saturday I'm going to New Mexico. I'll be packing and going on errands tomorrow... today I don't have time to mod. Just a few quick comments.... sorry! But if you have mod updates... keep in mind that I'm going to New Mexico. I don't think I'll be coming on here for a while... but I'll post pix on my site after I get back, so I'll tell you when I'm back, and if you want, you can go see them! Read the news paper in a innertube waiting for a sled race. when you close the news you are standing. 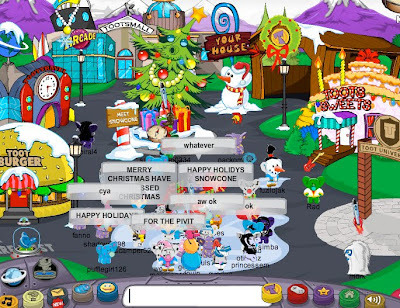 I found my first ornament in Treasure Hunt on CP! OMG MO I GOT AN EARLY CHRISTMAS PRESENT: A ZUNE! It's like an iPod, but I'm not allowed to get one of those... :( oh well. But my Zune is awesome! I got it early cuz i have to set it up here at my house. I can't set it up in New Mexico. I've put lots of cool songs on it... like Skillet, 4Him (one of the best Christian bands I've ever heard), Metallica (I saw the drummer of Metallica acting in a High School Musical play! ), and much more. My favorites so far are Whispers in the Dark by Skillet, Those Nights by Skillet, The Last Night by Skillet, and Turn the Page by Metallica. I've put tons of cp pictures on my zune! My zune is pink... rofl... not my color, but it looks really good on the Zune, and most of it's covered by my brown leather case anyway. I've got a couple cool vids on it so far... I can't figure out how to put certain vids on my zune, tho. Only ones that come with the software rofl. Anyway!!!! I LOVE MY ZUNE! Happened to me as well! First a smiley Face then a spech Bubble, I got freaked out a lot! But never heard of them songs and things but has anyone heard of Lady Gaga, Rihanna, Beyonce, Nelly Furtardo, Justin Timberlake, Timbaland, Selena Gomez. They are like amazing! And yes...1...2...3...4......5..6..7..8. Yes I think all of them are Americans! We (Uk) love American music! I love Selena cause she's in Wizards of Waverly place, the episodes, and she's amazing! P.S. Sorry for the long post!